The National Basketball Association real time links to NBA Rumors, Gossip and News from every major blog and newspaper on the web. According to Yahoo!, the latest New York Knicks rumors suggest that Fisher is the Knicks’ favorite candidate and that they’re the front-runners to land him: As the Los Angeles Lakers remain cool on the pursuit of Derek Fisher as a coaching candidate, the New York Knicks continue to cement themselves as the strong frontrunner to hire him, league sources told Yahoo Sports. 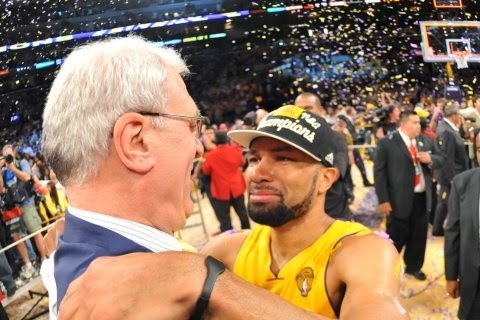 Knicks president Phil Jackson has been eager to sell Fisher, 39, on the possibility of Jackson mentoring him as part of a direct move from Fisher’s playing career into the Knicks head coaching job. Fisher is taking a few days to finalize his thoughts on the likely end of his 18-year playing career before fully engaging in talks to become a head coach. Nevertheless, the Knicks and Fisher expect conversations to begin before the end of the week, league sources said. How would Carmelo Anthony fit in Miami? nyknickstoday.blogspot.com All rights reserved . Simple theme. Powered by Blogger.